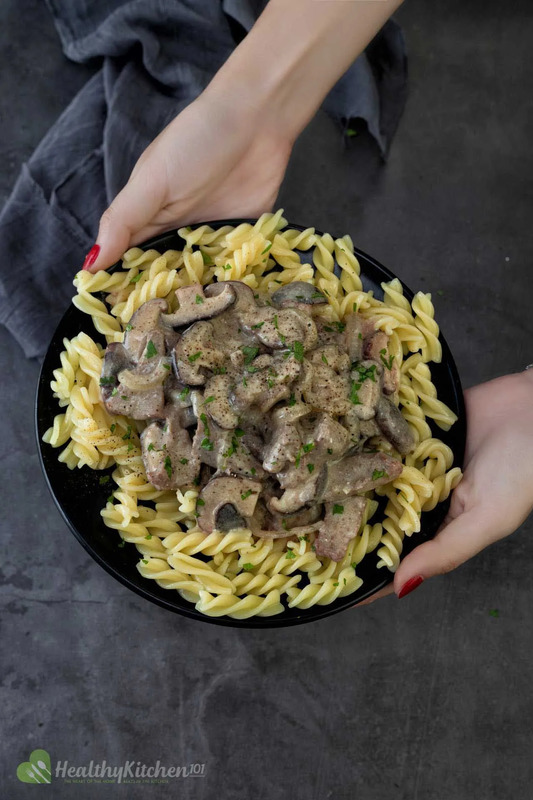 Classic comfort ready and waiting within 30 minutes – this Beef Stroganoff recipe is born to ease any of those impending winter chills. It’s rich, creamy, cozy, and versatile, with a wide range of healthy options. It’s one of those familiar grandma kind of recipes. I know, no way. No. Way. What cut of meat do you use for beef stroganoff? The type of meat cut is probably the most distinguishing feature in any beef stroganoff recipe out there. Okay so here’s my confession – my most earnest advice that I could possibly give: don’t try to be budget-friendly by half by selecting discount or cheap meat for your stroganoff. For this dish, it’s beyond desirable to opt for the expensive and lean fillets of beef. So, I’d like to name some: sirloin, top sirloin, tenderloin and boneless ribeye. Occasionally, ground beef or meatball is also allowed. Oh, don’t get me wrong, I’m not trying to start beef with other types of cut. I have proper motive, guys. You see, as you will only let the beef cook for only 15 minutes, what you’ll desire the most is a super tender cut that’s able to get juicy fast and melt wonderfully into the gravy. That being said, let’s save the tougher cuts of beef later for slow-cooker recipes or when hours-long marination is involved. But here, nope! How do you thicken beef stroganoff gravy? The process is barely a job for your left hand. What you should do is mix the starch (could be all-purpose flour or cornstarch) with liquid (preferable the liquid you use in cooking like beef broth, or else, water) until they’re well dissolved. The ratio for this little slurry should be 1 part starch to 2 parts liquid. If there’s chance you still find the gravy’s texture to be too thin, simply increase the amount of starch, or vice versa for the water. Leaving the skillet uncovered while simmering also helps evaporate the liquid a little bit, thus making the dish less watery. I bet my money at least one of you will go for sour cream – lovely choice. But there are still more. Have you heard of Greek yogurt and lactose-free sour cream? Both of them are high in protein and low in fat. Plus, they’ll lend the stroganoff sauce a dreamy nostalgic richness – these surely are go-to substitutes for the regular sour cream. The above two seem to be “enough” enough, but I still opted for a dash of Worcestershire regardless the risk of making my stroganoff gravy excessively syrupy. And oh, was I right! The condiment finished off my dish flawlessly with the outstanding, hearty meatiness. I am thrilled, people. Ready to try it yourself? What is beef stroganoff traditionally served with? Traditionally? Classic egg noodles have always been used. We all know that! But the possibilities do not end just there. In the past, I myself was so biased towards these noodles, too. But in time, I found out just about bunch of other fantastic old-but-new options for stroganoff. Extra protein sources: It may sound a little too over the top, but it isn’t illegal for you to tack on some pork or chicken, really. What is stroganoff for, if not gearing up your day of rest? Do just that. Veggies: Make a huge serving of them without regret, I say! Just kidding (read: not kidding…). Stir-fried or steamed greens will complement such a meaty and protein-piled-high dish big time. Please feel free to try out literally any kind of veggie. Beef Stroganoff recipe follows the exact common style of cooking everything in batches successively. This is aimed to enhance the complex flavor when the ingredients are all melted into each other, thus giving you a juicy, tender homely dish. Delicious comfort food - checked. Slice the beef into strips of 1 1/2 inches long. Only slice the meat against the grain. Feel free to adjust the cut size to your preferred bite size. In a skillet, sautée onions, mushrooms and garlic in butter over medium heat until the onions are translucent and the mushrooms turn tender. Stir the beef strips to the same skillet with 1 cup of broth, salt and Worcestershire sauce. Bring them all to a boil. Reduce heat, cover and let simmer for 15 minutes. Make the starch slurry: Stir the remaining 1/2 cup of broth into flour and whisk well. Pour the starch slurry to the skillet. Continue to stir in sour cream and stir them all constantly for 10 minutes. Remove the skillet from heat and prepare to serve.